Try a brand-new sport – NORDIC WALKING. In one hour you can incinerate 400 kcal from your body, improve your body holding and increase your physical condition of 40%. 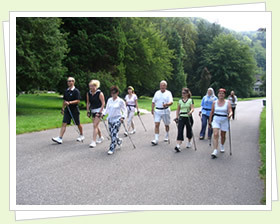 Th e NORDIC WALKING comes from Finland. Th is sport is suitable for everybody without regard to talent, physical condition and age. It is walking with special walking poles. Many people say the NORDIC WALKING is a new "salutary sport". You can practice the NORDIC WALKING anywhere – in the city, park, forest and mountains. However the most suitable is the free nature.